Evergreen content : What? Why? How? 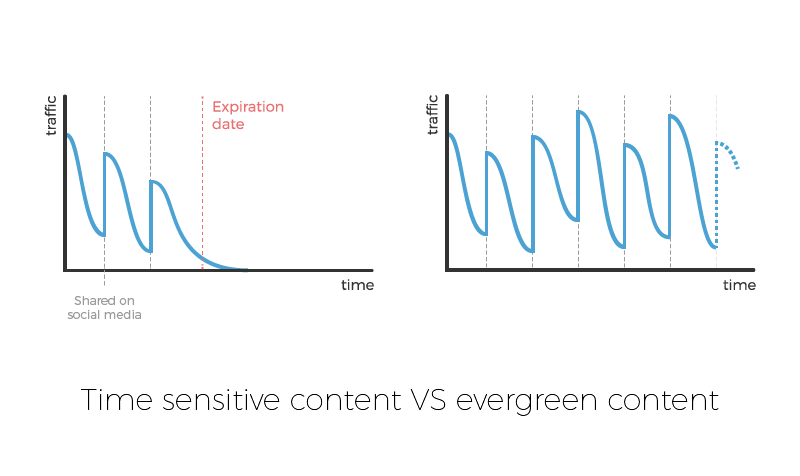 Just like evergreen trees keep their leaves all year around, evergreen content doesn’t fade. Evergreen content is a publication that stays fresh and relevant no matter the time of the year and preferably for many years. What makes a piece of content evergreen is that it’s not about current events, a specific holiday, a trend or other short-lived themes. It is about themes within your industry that would interest your readers at any time of the year. For example, it might be an article on how to choose a computer or a podcast about the basics of marketing. This type of content stays relevant a long time after its publication and will attract new readers at any time of the year. Plus, since they address a timeless subject, they rarely need to be updated throughout the years. 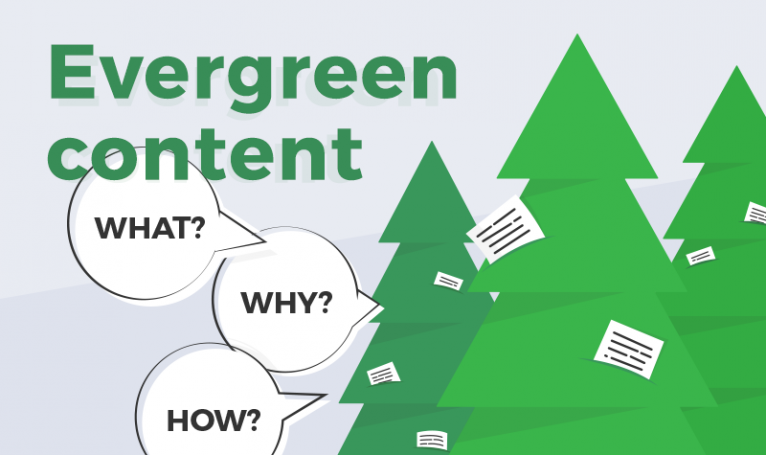 Why should I write evergreen content? Because an evergreen publication stays relevant for this long, it is a very good investment of your time and money. An evergreen article is worth so much more than an article that will be outdated in a few weeks. Businesses are becoming more and more aware of the importance of this kind of content. In fact, 85% of top performing marketers [B2B] deliver content consistently over time. Both B2B and B2C businesses increased their content marketing budget over the last years and the results are there with 34% of B2B businesses stating that their content marketing strategy is extremely or very effective at helping their organization achieve their current content marketing goals. In fact, 70% of B2B businesses expected to produce more original content in 2017 compared with 2016. So how can evergreen content benefit you too? Mainly in two ways: search engines rankings and traffic. Search engines send robots to crawl your website and check it. If the content doesn’t seem relevant to it and if your content doesn’t get much traffic anymore, it will be listed accordingly and it probably won’t have a good ranking in web searches anymore. On the contrary, a piece of content that gets regular traffic and has timeless content will come up more often in related web searches. Actually, according to SEO experts, content marketing is a great actionable SEO technique and you can achieve great rankings by investing your time in writing quality evergreen articles. Evergreen content is amazing at bringing you traffic. Well, I know, every piece of content you are writing, as long as it’s relevant to your audience, will bring you traffic, but evergreen content will bring you traffic forever. Sure, it will take you more time to write than time-sensitive short articles, but with no expiration date, your evergreen publications will bring you more traffic than dozens of short-lived pieces of content over the long-term. Those are two of the many advantages of investing your energy in evergreen content. So stop wasting your time and money writing short-lived content and improve your traffic, rankings, and audience with some quality evergreen publications! How should I share my evergreen content on social media? Yes, I’m sure that you already have a strategy to share your content, but evergreen content is special. You spent time, and sometimes money, into crafting interesting evergreen content for your readers: this content get special treatment! Since evergreen content stays relevant, you don’t want to share it just a few times, otherwise you wasted your time writing it. You want to promote this content on a regular basis over the next years. This actually sounds like a very task, I know. It seems like it will just add up to your other tasks but with the right tools, you can share your evergreen content forever, without adding to your schedule. Repost is a tool created for evergreen content. Add your articles to the library, activate your messages, set up your schedule and here you go: the tool will repost your content smartly on a regular basis. Tools like this one will take care of your evergreen content without adding to your daily tasks. You can also check this list of other Social Media Tools to automate Content Distribution. How should I pick a subject? I have three tips for you when it comes to finding ideas on what to write. You can probably find a lot more ideas online but these three tips will give you a lot of subjects to get started. Ask yourself two questions: What audience are you writing for? What issues do they encounter? Finding their shared interest shouldn’t be hard. If you blog is about marketing, your audience will be other bloggers who try to market their blog/product. If your blog is about dogs, your audience is probably composed of a majority of dog owners. Now ask yourself what are the issues they have that you can write about? Dog behavior tips, tips for visits to the vet, puppy care… The list goes on, you can start writing now! Creating personas to better understand your audience is a great way to find new topic ideas : 6 reasons why you should define your readers personas. If you are selling a product/service, you can advertise through content. Ads can be annoying, plus it doesn’t really count as an article since it doesn’t bring anything to your audience. Instead, find a different angle: write about the benefits that this service will bring them and expand your article by adding useful tips and maybe by interacting with your audience asking them what products they use themselves. If you run out of inspiration, sneak a peek at your competitors’ blogs but also the content they share to their audience on social media. This might give you an idea of what content works for them but you might also find new ideas by analyzing what they write about and how they audience reacts to their articles (the comment section can be fun to explore too). Those three tips will get you started! For more ideas and inspiration, check out these 15 Evergreen Content Ideas That Will Boost Your Website Traffic. Head of product @ Elokenz, I am in charge of product and design across print, desktop, web and mobile user experience optimization and features development. Currently based in Toulon, France. Elokenz is a free tool to check your online impact as an identified author. We use the rel='author' tag on your pages to provide you all the statistics about your articles. The tool lets you engage with more readers and as a consequence, to receive more inbound links, social mentions and visitors.